Remodeled in 2011, the South Clinic is the largest clinic site with numerous services available. Residents are welcomed into a comfortable reception area that services six private, fully accessible exam rooms to help keep a steady patient flow. On most Monday, Wednesday and Friday mornings, the Health District is able to provide two physicians on site to provide prompt high quality medical care. The South Clinic is also home to all Stickney Public Health Departments and services: Public Health Nursing, Podiatry, Optometry (Illinois Eye Institute), Dental, Behavioral Health, Emergency Response and Environmental Health. 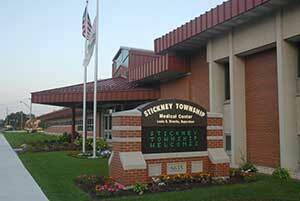 Stickney Township services at this location include: General Assistance, Township ID cards, Passport services and vehicle stickers for residents of Central Stickney and Nottingham Park.